Is Phillips-Van Heusen's Stock Cheap by the Numbers? The consistency of past earnings and cash flow. How much growth we can expect. 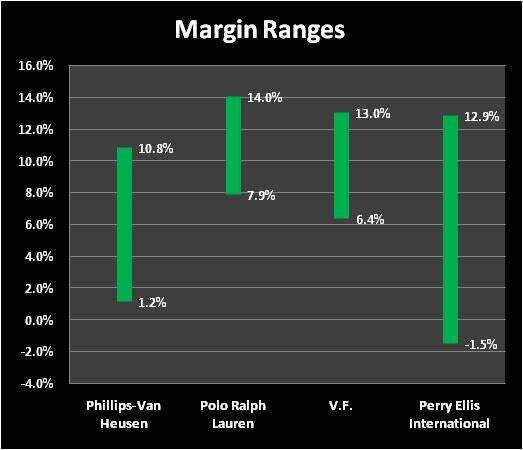 Let's see what those numbers can tell us about how expensive or cheap Phillips-Van Heusen (NYSE: PVH) might be. First, we'll look at most investors' favorite metric: the P/E ratio. It divides the company's share price by its earnings per share -- the lower, the better. Then, we'll take things up a notch with a more advanced metric: enterprise value to unlevered free cash flow. This divides the company's enterprise value (basically, its market cap plus its debt, minus its cash) by its unlevered free cash flow (its free cash flow, adding back the interest payments on its debt). Like the P/E, the lower this number is, the better. Analysts argue about which is more important -- earnings or cash flow. Who cares? A good buy ideally has low multiples on both. Phillips-Van Heusen has a P/E ratio of 82.8 and an EV/FCF ratio of 19.6 over the trailing 12 months. 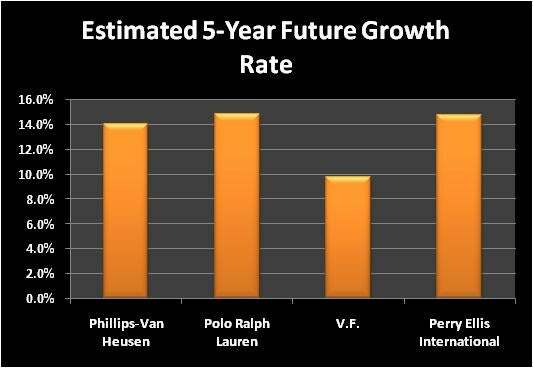 If we stretch and compare current valuations to the five-year averages for earnings and free cash flow, Phillips-Van Heusen has a P/E ratio of 34.5 and a five-year EV/FCF ratio of 29.9. A positive one-year ratio under 10 for both metrics is ideal. For a five-year metric, under 20 is ideal. PVH is zero for four on hitting the ideal targets, but let's see how it compares against some competitors and industry mates. Source: Capital IQ, a division of Standard & Poor's; NM = not meaningful. An ideal company will be consistently strong in its earnings and cash flow generation. In the past five years, PVH's net income margin has ranged from 1.2% to 7.6%. In that same time frame, unlevered free cash flow margin has ranged from 6% to 10.8%. Source: Capital IQ, a division of Standard & Poor's; margin ranges are combined. Additionally, over the last five years, Phillips-Van Heusen has tallied up five years of positive earnings and five years of positive free cash flow. Analysts tend to comically overstate their five-year growth estimates. If you accept them at face value, you will overpay for stocks. But while you should definitely take the analysts' prognostications with a grain of salt, they can still provide a useful starting point when compared to similar numbers from a company's closest rivals. Let's start by seeing what this company's done over the past five years. 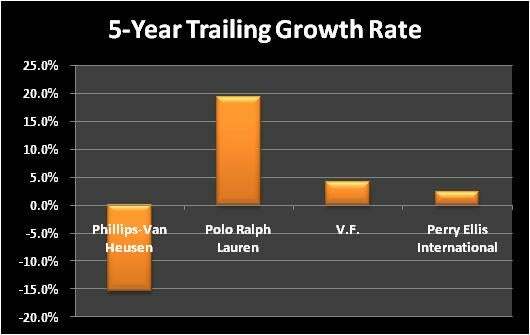 In that time period, Phillips-Van Heusen has put up past EPS growth rates of -15.4%. Meanwhile, Wall Street's analysts expect future growth rates of 14%. Source: Capital IQ, a division of Standard & Poor's; EPS growth shown. Source: Capital IQ, a division of Standard & Poor's; estimates for EPS growth. The pile of numbers we've plowed through has shown us the price multiples shares of Phillips-Van Heusen are trading at, the volatility of its operational performance, and what kind of growth profile it has -- both on an absolute and a relative basis. The more consistent a company's performance has been and the more growth we can expect, the more we should be willing to pay. We've gone well beyond looking at a 82.8 P/E ratio, and we see that none of its price multiples are especially cheap but that Phillip-Van Heusen has kept its earnings positive despite negative growth. But these initial numbers are just a start. If you find Phillips-Van Heusen's numbers or story compelling, don't stop. Continue your due diligence process until you're confident one way or the other. As a start, add it to My Watchlist to find all of our Foolish analysis. Anand is the Managing Editor of Fool.com. He loves pithiness, clever turns of phrase, and helping people simplify their money decisions.